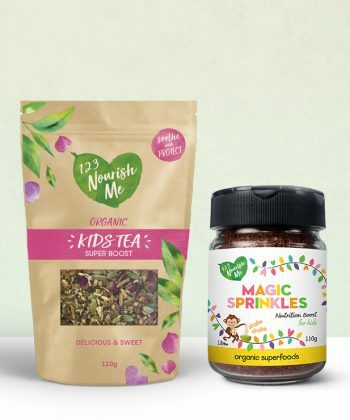 Get your sprinkle on! Fussy kids? We’ve got you covered! 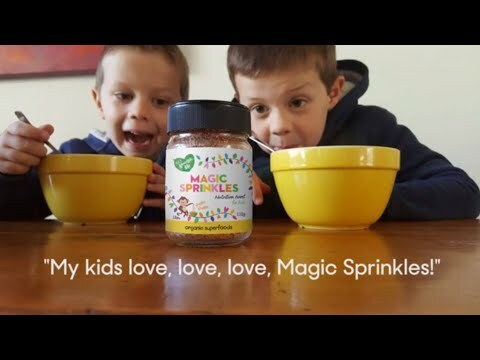 Kids love Magic Sprinkles! 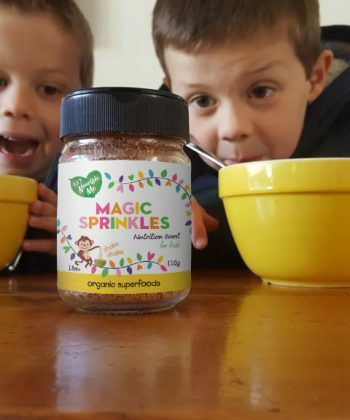 Magic Sprinkles are a nutritional powerhouse shaker of organic superfoods brimming with vitamins, minerals, healthy fats and immune boosters. 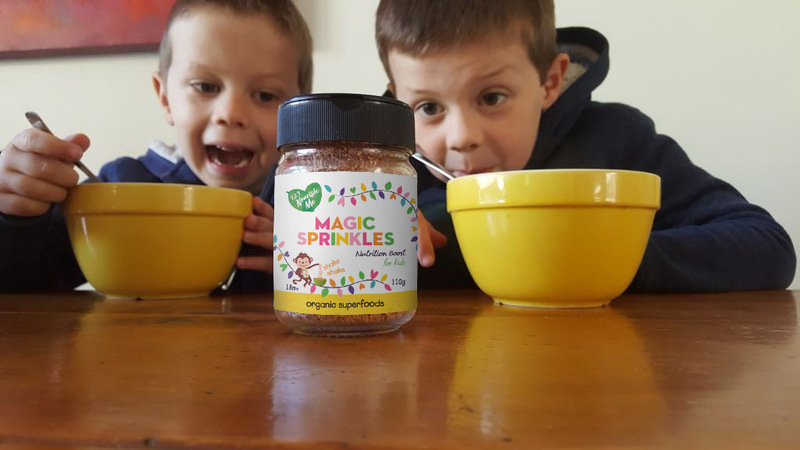 Magic sprinkles are designed for kids to increase their nutritional profile and can be added to any food any time. 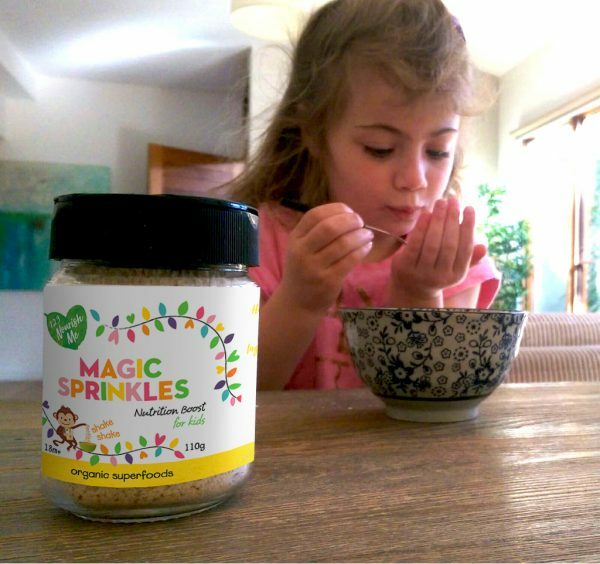 Magic sprinkles are made from the highest quality living wholefoods and are designed for little fingers to sprinkle themselves. Filled with antioxidants and packed filled with nutrients this is pure magic in a shaker! 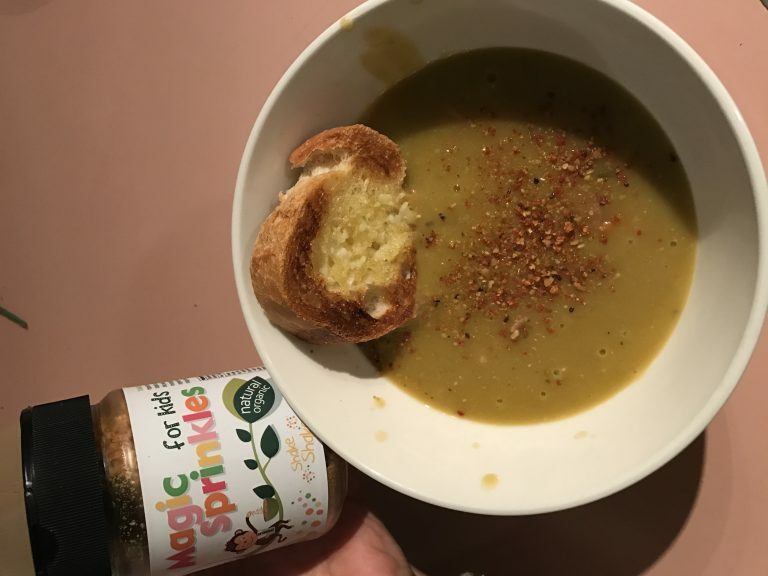 Our fave suggestions: Add some magic to porridge or cereal, sprinkle on popcorn or add to bolognaise. 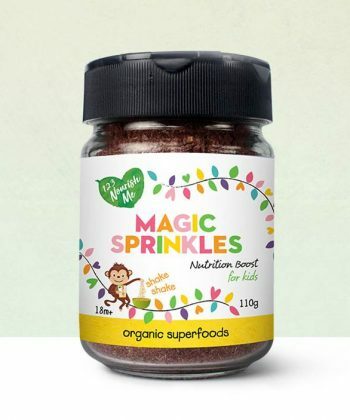 Magic Sprinkles are the perfect addition our delicious Rasberry ice cream recipe or try it on our recipe for Immune boosting mash. Yum yum! Despite their tiny size chia seeds are among the most nutritious foods on the planet. They are loaded with fiber, protein, Omega-3 fatty acids and various micronutrients and are a brilliant way to up the nutrients in our kids. We only use insecticide free sunflower seeds in our magic sprinkles. Sunflower seeds are a great source of vitamins and minerals, especially vitamin E. They are loaded with nutrients and extraordinary health benefits and are fantastic for immune systems and nervous system regulation. Traditionally sunflower seeds were used to treat depression and mood disorders. When we think of sunflowers – they are the flower of happiness and it makes us happy to have these beautiful seeds in our magic sprinkles. Blackberry Powder is freeze dried to maintain the flavor, aroma, and nutritional benefits of fresh, juicy wild harvested blackberries. Bursting with antioxidants and vitamins, blackberries are a great immune booster. Flaxseed is one of the most concentrated plant sources of omega 3 fats. We love flaxseeds because kids need good quality fats to keep them full and nourish their brains and bodies. Flaxseeds are also rich in antioxidants, brimming with vitamin B, fabulous fibre, protein and potassium. Cranberries are known to be a good source of various vitamins and antioxidants. Historically, they have been used as treatment for bladder and kidney diseases and they are a brilliant source of Vitamin C.
Mango powder is used a natural fruit sweetener and is brimming with Vitamin C. We use freeze dried Australian Mangos in our mango powder and we dry our mango at temperatures that keep lots of nutrients in. Organic strawberry powder is an excellent source of vitamin C, antioxidants, and dietary fiber. Made from freeze-dried strawberries, this raw organic strawberry powder retains all of the protective nutrients of real strawberries. Psyllium husk’s health benefits can be attributed to its dietary fiber content. Soluble fibers like psyllium husk are prebiotics that facilitate the nourishment of beneficial bacteria in the lining of your gut. These beneficial bacteria help with proper digestion and absorption of food and play a role in improved immune function. Psyllium is amazing for keeping the bowel healthy and strong and is a great food to consume daily if you need help getting your bowel moving! Camu camu is a berry with extremely high levels of Vitamin C. This powerhouse filled with more Vitamin C than an orange! Vitamin C cannot be made by the body and must be taken by the diet. We know how important it is to keep kids vitamin levels up (especially in winter) and we love camu camu because it strengthens the immune system, is high in antioxidants, balances mood and is highly antiviral. Maqui berry is one of the most antioxidant rich foods in nature and filled with vitamins and minerals and anti-inflammatory compounds. It’s shown to have fantastic antiviral properties too and is the most beautiful colour! We love that this berry powerhouse is sprinkled through our magic sprinkles. Fragrant, delicious and filled with B- complex vitamins that help enzyme synthesis and nervous system function. 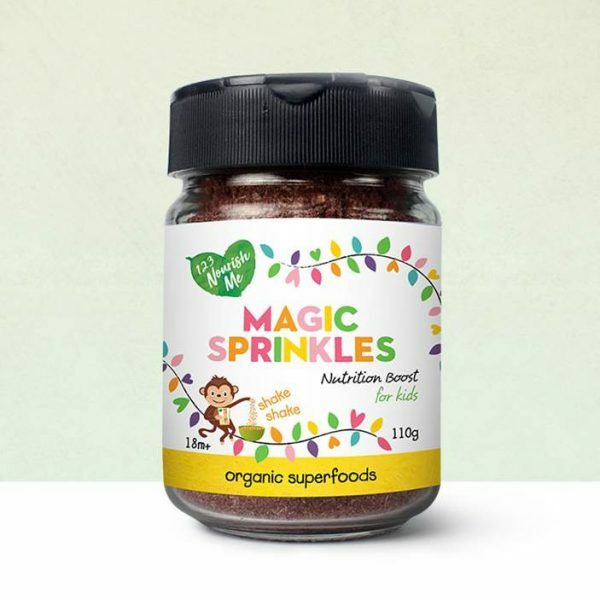 We use organic vanilla bean powder to balance the flavour within our magic seed mix. This miracle of nature is from the Kimberleys in Western Australia and is a potent, natural wholefood source of Vitamin C. Kakadu Plum is an incredible traditional aboriginal bush food and it’s an ingredient that we use in every one of our products because of it’s nutritional and topical benefits. 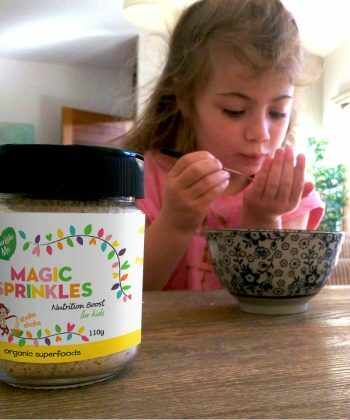 We use Stevia as a natural sweetener for our magic sprinkles. Stevia is a plant that has a sweet taste with a slightly bitter after taste but unlike many sweeteners it does not raise blood sugar levels in the same way as a sweetener like sugar does. So many amazing benefits to our beautiful organic monk fruit – which is a highly potent antioxidant and is Anti-Inflammatory to the human body. Monk fruit is also believed to reduce fatigue. Perhaps our most important and beneficial ingredient we have, you will find this in every single one of our products. 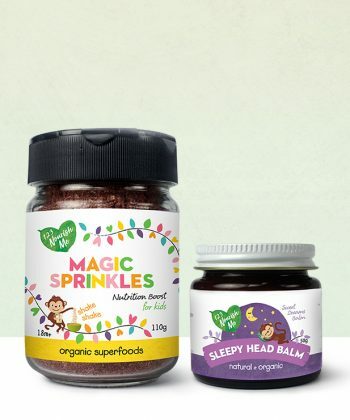 This products is filled to the brim with love and hugs and designed to promote and enhance the health and wellbeing of your family. We find love and hugs make each product extra special!